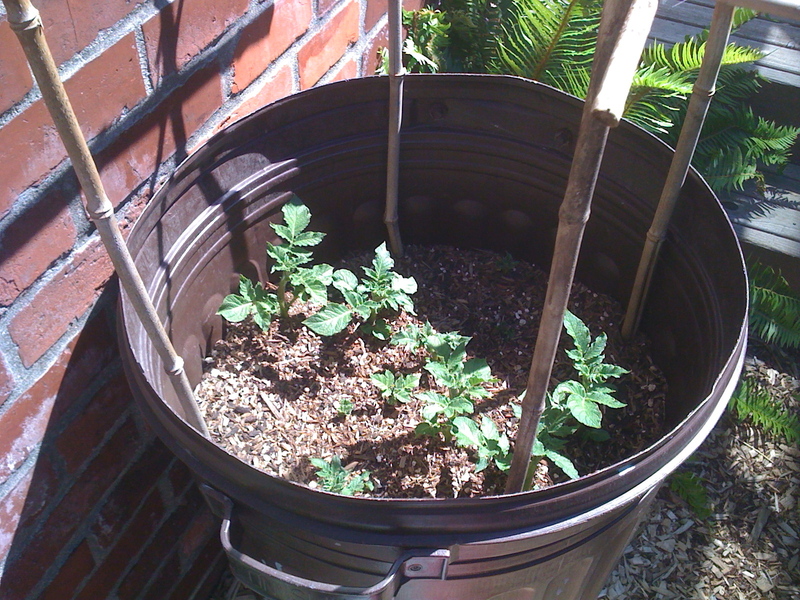 Have you ever grown potatoes in a barrel? This is my year, I’m sure of it. Last year, after a promising beginning, I bombed, probably because of my usual sin of overkill–too much water, too much plant food/the wrong plant food . . . You get the idea. Just when I started going out every morning to check for potato-vine blooms, the whole patch turned yellow and (eventually) slimy. Depressing. Last summer was cooler and rainier than usual, anyway, so I just gave up, pulled up the vines, and left the barrel full of compost to over-winter. 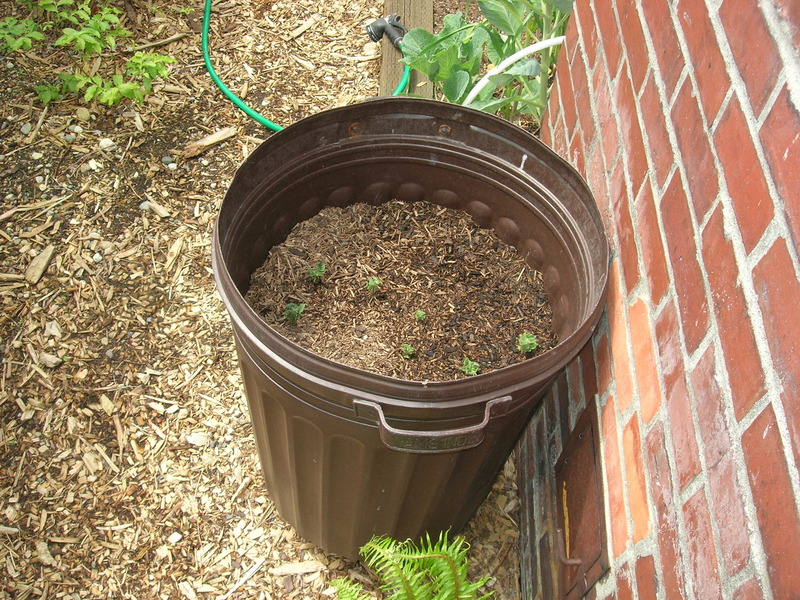 Then this year, Linda the Gardener suggested that I go out there, clean out the barrel, and start ove r. I always do what L the G tells me: but on tilting over the barrel to dump it out, what did I find just below the surface but a bunch of jaunty little potato vines! Looks like I did better than I thought last year–grew some babies and left them to sprout this year. So maybe this year I will be able to complete the cycle! Toward the end of the summer, the vines will bloom; after that, they will produce new potatoes all along the buried vines. On any pleasant afternoon, I’ll decide that dinner won’t be complete without some Yukon Golds, so I’ll go out and scrabble around in the barrel until I come up with a hand-full of tender young potatoes, which I will go into the kitchen and cook right now! Eventually, the vines will die back, and a couple of weeks later, after the potatoes have hardened off, I’ll harvest them and store them in straw in the garage, to eat all winter! Please, let this happen this year! 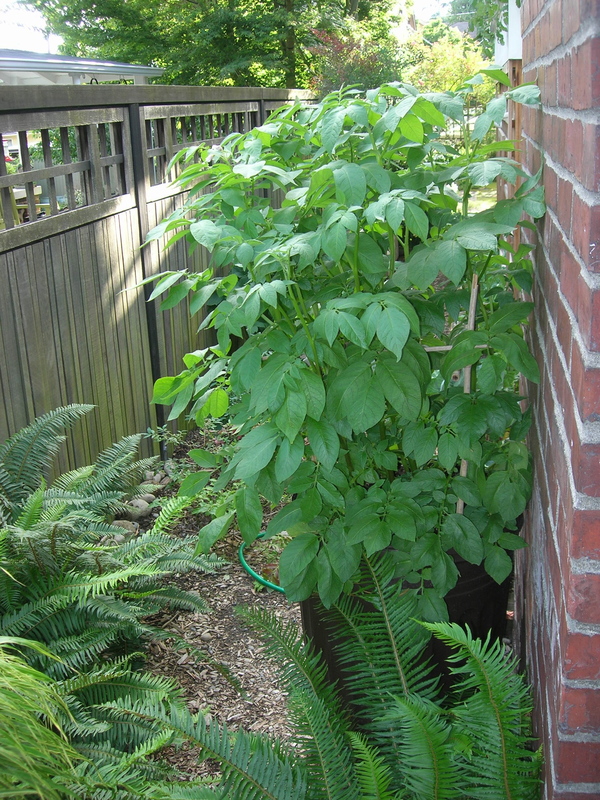 As of July 16, my potato vines are tall and blight-free! 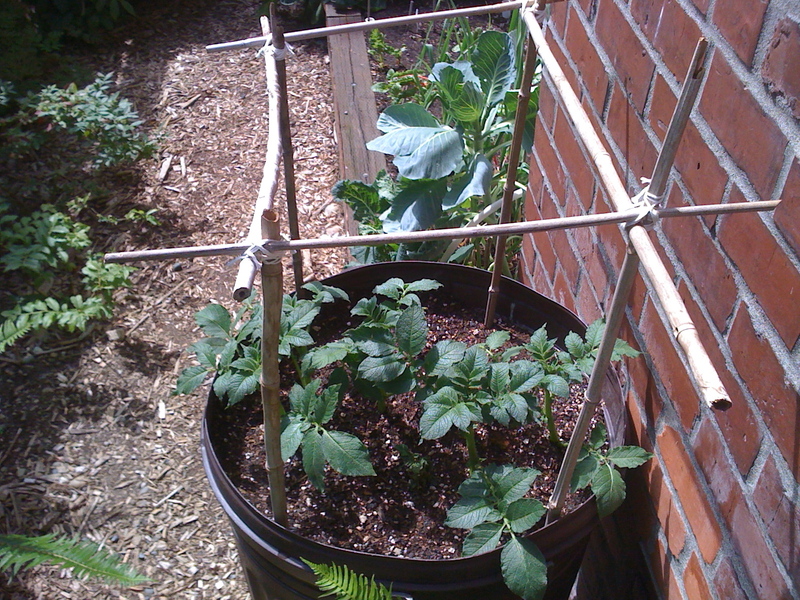 All I’ve done is add a little plant food every couple of weeks, water sparingly, and support the stems by tying them to the trellis with velcro loops. Soon, I hope I’ll be eating potatoes! 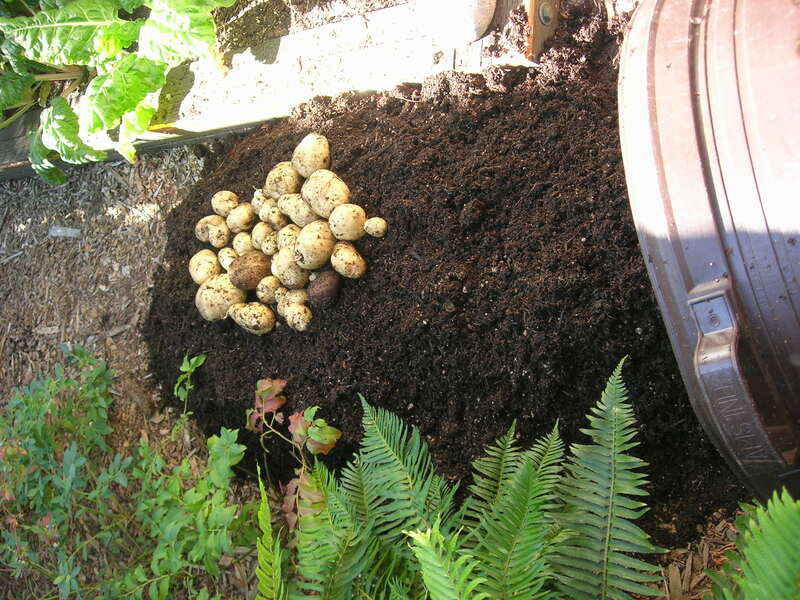 I never dug deep enough in my potato barrel to find any new potatoes; my friend Bob Hart warned me that a problem with growing in a barrel is that, to get to the potatoes, you sometimes end up doing too much damage to the plant. So I was cautious. Then these flourishing green vines began to droop and yellow; I didn’t know whether they were just following their usual cycle or dying of some dreadful blight. So I took my usual path–I idled and watched. Finally, on a sunny day about a week ago, I just decided to tip over and clean the barrel. Guess what!–scraping out the dirt and compost, I suddenly hit the mother lode. Potatoes! Big fat Yukon Golds, a mounded colander of of beautiful earthy potatoes! I’ve steamed some, I’ve fried some, and tomorrow I’ll roast some, and I’ll still have plenty to go. Next year I have to do two barrels! 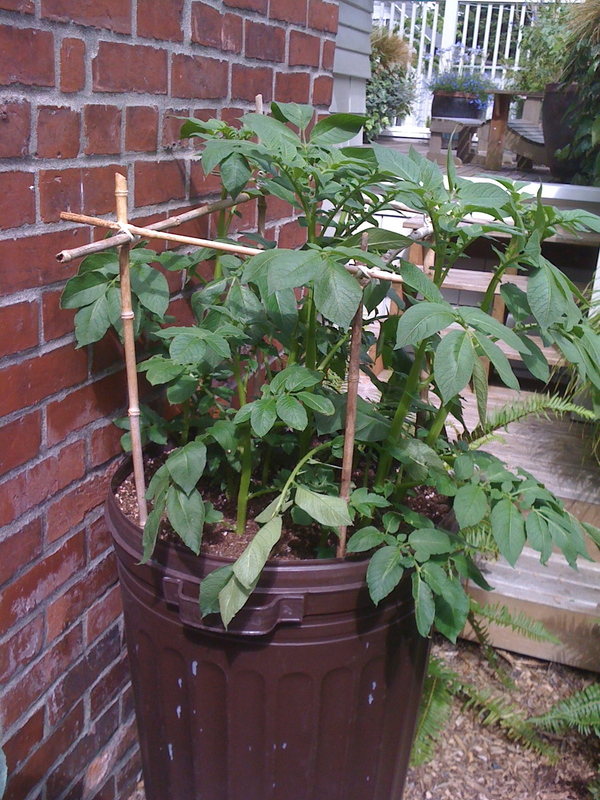 This entry was posted in Gardening and tagged growing potatoes in a barrel, growing vegetables, how to grow Yukon Gold potatoes, potato barrel by judyramey. Bookmark the permalink.